Bitcoin.Tax is the leading service to help users of crypto-currencies calculate their capital gains and income tax liabilities. Support for individuals and self-filers as well as tax professional and accounting firms. Import details of crypto-currency trading from one of the supported exchanges, any spending or donations that have been made, and any mined coins or income received. 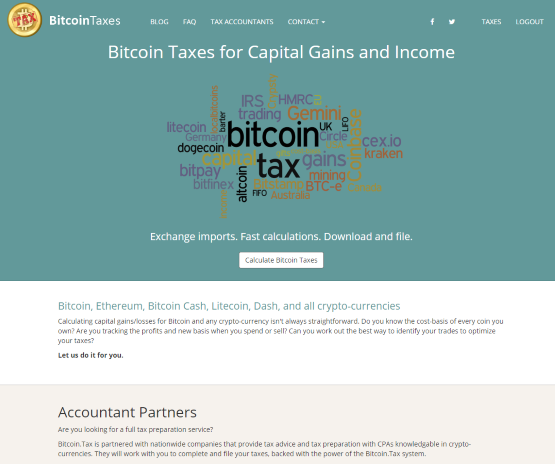 Bitcoin.Tax will calculate income and capital gains tax liabilties. Compare capital gains/losses using different cost-basis methodologies, including FIFO, LIFO, and averaging/adjusted cost basis with or without like-kind treatment (prior to 2018 in US). Download capital gains reports as CSV, Schedule D 8949 PDF and 8949 attachable statement. Import reports into TurboTax H&R Block, and TaxACT or anywhere supporting TXF. Produce reports for income and mining, gifts report and final closing positions.